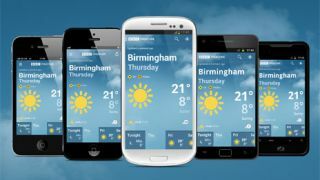 Having seen an increase in people checking the BBC Weather site on their phones over the past year, the BBC has launched a new dedicated weather app for iOS and Android users, presenting all that gloomy weather news in a lovely themed display. Available now to download from the iOS and Android app stores, the app can put your GPS to good use or you can set your upcoming holiday destinations as you wish - or, if you prefer, you can set one option to Alaska just to make yourself feel better about the maudlin British summertime. Android users can add the app as a widget on their home screens and, for some reason, share favourite locations over NFC by touching two phones together. We're not sure why you'd do this, but hey. Get involved.